In the aftermath of Hurricanes Harvey and Irma, as the communities of Houston begin to recover from destructive floodwaters, many outside of the affected areas are left to consider how a similar event may impact their own homes and communities. Our reality is that these powerful events are not isolated. Storms will continue to become more intense and frequent, heat waves will arrive more often and last longer, and we need to start planning now. Building management systems and utility tracking are not new to the field of facility management. But building monitoring, when designed and run effectively, can play a crucial role in improving a facility’s ability to adapt to and recover from the next event. Power outages are common in the wake of a severe storm. Nearly a quarter-million customers reportedly lost power in Texas the Saturday following Hurricane Harvey. Extended power outages can quickly result in uninhabitable environments for occupants, particularly in climates that experience extreme temperatures. Understanding how a facility may operate in limited or no power situations can help facility managers optimize mechanical systems and prepare building occupants, ultimately improving a facility’s passive survivability. Energy monitoring in buildings not only allows for efficient operations on a day-to-day basis, but can also give an in-depth understanding of how a facility uses energy, how much the critical systems require, and when they require it most. During emergencies, this information can inform critical decisions and may allow a facility manager to turn off unnecessary loads or divert resources to where they are really needed. Solar generation and energy end-use monitoring on a Living Building Challenge building dashboard. Image: Linnean Solutions. Unexpected flood waters can severely damage buildings and systems, affect facility operation, and impact occupant safety. Hurricane Harvey’s floodwaters, along with severe winds, were estimated to cause as much as $40 billion in damages, leaving countless buildings destroyed. Sensor, leak detection, and monitoring technology can provide real-time assessment of rainfall and flooding conditions, allowing for rapid response and early evacuation if needed. Rainfall, flow, and groundwater monitoring for permeable pavement installation in the Boston Architectural College’s Green Alley. Image: Linnean Solutions. During times of emergency, access to critical resources like food and water can be limited. A loss of electricity may result in the inability to pump potable water to upper floors of high-rise buildings. The floodwaters of Hurricane Harvey introduced harmful bacteria and pollutants with the potential to contaminate drinking water sources. In severe flooding conditions where water supplies are compromised, facilities may need to rely on stored water to maintain occupant safety. Monitoring of water systems in buildings can provide critical information and support effective management of crucial resources in hazardous situations. Understanding a building’s water consumption under typical conditions will allow facility managers to gauge how much water will be required in emergencies. Real-time monitoring of cistern water-levels can inform decisions about how long occupants can safely stay in a building or whether external resources, or even evacuation, are required. 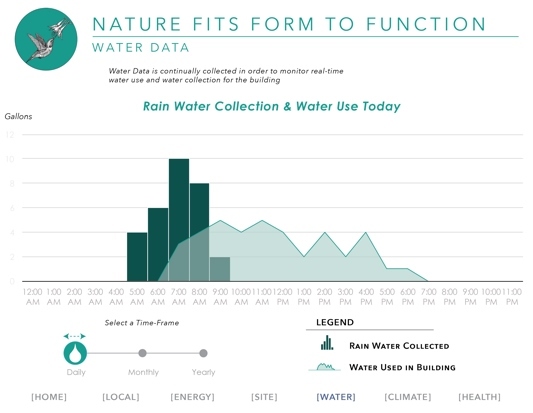 Rainwater collection and water use monitoring on a Living Building Challenge building dashboard. Image: Linnean Solutions. Occupant safety is a facility manager’s top priority. In certain climates, power outages can result in indoor environments quickly becoming too hot or too cold. Flooding or water intrusion can bring unwanted and potentially hazardous pollutants inside, impacting the quality and safety of indoor environments during and long after a severe storm. Having effective systems in place to monitor indoor environmental conditions can greatly improve the ability of occupants to respond to emergencies and maintain health and safety. Monitoring of indoor temperature and humidity can alert facility managers to areas of the building that may be unsafe for continued shelter. These monitoring systems can detect where in the building air quality may be compromised due to emissions from equipment that can no longer exhaust to the outdoors, emissions from emergency generators that are not typically run for extended periods of time, or harmful pollutants that have been introduced indoors through building damage or flooding. It is common for multiple hazards to arrive together, such as flooding along with power outages and poor indoor environmental quality. However, monitoring systems will be unable to gather data on critical building conditions without power. To prepare for these situations, it is necessary to give facility monitoring systems access to alternative energy sources, such as battery storage, and to ensure critical servers can connect to back-up power. Monitoring of systems and conditions in a building is an important piece of facility resilience, but understanding and communicating the information gathered from the data is key. Collecting, analyzing, and interpreting building data either on an online platform or physically on site via a dashboard is not only valuable to facility teams, but can also provide critical information to occupants or the surrounding community when other communication channels are affected.